From ancient times, poets, sages, saints, philosophers, scientists, cults, the individual human being, have pondered about the existence of a higher Being. We try to understand this Being with names, beliefs and concepts like Nature, Universe, God, Buddha, Allah, Shiva, the Tao, Life, Spirit, Energy, Creator, etc., etc. But the truth is that we do not know with certainty what this Being is, nor how it emerged into existence, into Life. We have assumptions, theories, hypothesis, but we truly do not know. It is a mystery, as profound as the mystery of Life itself. Yet there is a property of this Being we have come to know through science, and this is that energy and mass played, and continues to play, a fundamental role in its emergence and development, establishing a symmetry where energy is a measure of its mass, and mass a measure of its energy (e=mc2). This symmetry provided the stability essential to its evolution into the unfolding complexity we strive to comprehend. But this symmetry, this equilibrium in which the content of an element is a constant measure of another, cannot be attained without a degree of self-reflection. As any other body or system in our Universe, the energy sources my changing body consumes must be a continuous measure of its exertion. I could not exist otherwise. And whether I do it consciously or unconsciously, this constant balancing act is not possible without a degree of self-reflection. Self-reflection is the foundation of Life. What is beautiful about the level of knowledge we currently have about our Universe, is that science has opened windows to the human mind which organized religion has kept tightly closed with dogma. Those open windows let me peer into the behavior and organization of the Being I am a part of: How, for instance, as I emerged myself, it has emerged with the innate urge to adapt and survive; how, as I evolve myself, it evolves, tentatively, yet steadily, toward higher levels of complexity and order; how, as I do myself, it controls yet frees its own creations, imprinting them with a code of rules that must be followed, yet can be bent. But the deeper I peer into the composition and complexity of our Universe, the less I know about the reason for its existence, its symmetry, its creativity, the magnificence and ruthlessness of its power. Yet there is a conspicuous Force that propels its existence beyond the natural boundaries that check its evolution; this Force is Self-reflection. The riddle of Life trying to understand itself; the Force of Life reflecting upon its own force. My mind grows beyond the limits of my own body, and I am set free. I am set free to know what I am, to know why a Force inside of me, born into me and all around me, wants me, incites me to reach out, to overcome boundaries, to know. But this Force is, must always be, a reflection of my limitations. Energy equals mass times the speed of Light squared. The mass of a body is a measure of its energy content. I am an organization of about 37 trillion cells plus trillions of bacteria. Their combined mass is the measure of the power I have not only to give structure, motion and purpose to my body, but also the power of a mind able to conceptualize an entire Universe, and wonder about its emergence, about its purpose. Body and mind supporting the symmetry that creates me, that gives me life; measuring each other, reflecting upon one another. The meaning, the essence of e=mc2 is Self-reflection, the foundation of Life. I have never been good at mathematics. I didn’t even try when I was in school. Although I can understand their allure, numbers and equations always seemed not just beyond me, but beyond the capacity to explain what is truly important to me: the emergence of conscious self-reflection in Life. Fortunately, I am good at seeing patterns and their logic, and so I was able to survive my tenure in the financial industry while sifting for meaning through mostly mathematical theories. My early realization, and total acceptance, of the Facts that I am a universal component and not very good at mathematics, brought me to the conclusion that the only way for me to begin to understand what I am in the scheme of the Universe, was by applying to my own body, to my own life, to my own experience, the philosophic knowledge we already possess of the physical theories; in other words, making myself an experimental tool. My interest in Relativity started with Einstein’s ideas and the impact they made, and continue to make in the way we understand our Universe. He fascinated me for the immensity of his insight … a mind able to envision a fundamental property of Nature, E=mc2 … and so, without previous education in these matters, I embarked on a quest to try to understand the meaning of the famous equation. Most books on the subject were prominently mathematic, but I persisted, trying to find between the equations the meaning of Einstein’s insight. And after many, many years of study, and guided mainly by his own description of the equation on the paper he published in 1905: “The mass of a body is a measure of its energy content”, I begun to see the light at the end of the tunnel. The mass of a body is a measure of its energy content. And my body was my tool to try to understand this. I know that at the most basic level my body is made of atoms. I also know that atoms are fundamentally small concentrations of mass and immense reservoirs of energy. Therefore, I fundamentally am a concentration of mass and an immense reservoir of energy. The mass of my body was easy to figure out: It is what has grown out of two cells into a 5.10” tall, 150 lb. organism; it is what I can touch, what I can weigh, what I can measure, what I can play with; it is what breathes and eats, it is what consumes and dissipates; it is what I direct to sit down or walk; it is what hurts and makes me uncomfortable when I injure myself or get sick. The energy was more elusive. Where, What was that immense portion of me, the measure of which is equivalent to the content of my mass times the speed of Light squared? I started comprehending what this immense energy is, when I realized that what I’ve been taught to be subjective, immaterial … mind, thought, ingenuity, curiosity, focus, persistence, imagination … is actually physical energy; energy that I can almost touch, it is so real, so perceptible. I am not only the energy I metabolize and transform into the physical acts of motion, action and reaction; I am also the physical energy of thinking, imagining, focusing, calculating, learning, making decisions that can change the direction of my life, and decisions that sometimes can change the lives of others; I am the physical energy of a mind that is practically boundless, immeasurable, yet endowed with a physical, tangible power to make an impact on my own development and, sometimes, on the development of the world in which I exist. There is, for me, no clearer example of the power contained in a human mind, than Einstein’s encapsulation of one of the properties of our Universe in e=mc2 . But what the meaning, the true essence of the equation is, I’ll try to explain on my next post. On previous posts I have written about the universal blueprint that interconnects every component in our Universe with a matrix of fundamental properties: Become, Self-organize, Bond, Self-generate, Adapt, Self-perpetuate, Transform; a matrix that connects everything to ensure not only Survival, but also, with self-evident creativity, the continuity of a process that leads to increasing complexity, and ultimately, to Self-awareness (you and me are evidence of this process). But although this fundamental level of our interconnectedness has been obvious for a long time to visionary scientists, philosophers and poets, our collective mind has not yet incorporated it into our perception of Reality. It is thus I feel compelled to continue writing about the universal blueprint, because our incapacity to perceive how it connects us with one another and with the rest of Nature is tearing us apart; we are killing each other, we are at war with the creative process that ensures our own survival, we are recklessly changing the chemical equilibrium of the earth’s environment – our source of life. To prove the extent of our interconnectedness, I will demonstrate how … without regards to race, faith, orientation … the properties of the universal blueprint render us all fundamentally the same. Becoming: Becoming is not of our choice; we are all engendered, without our consent, to become participants in the unfolding of a creative process. Self-organization: The process of self-organization in our bodies is not of our choice either; at conception we inherit the blueprint that maps the species-compelled generation and organization of our supple framework. Bonding: We bond in two complementary ways: One is internal, as we interconnect all of our components into a cohesive and functional body; the other is external, as we interconnect with other bodies in lasting or fleeting relationships. Self-generation: We self-generate in two complimentary ways: One is the capacity to generate our own components, the other is the capacity to generate our kin. Adaptation: Whether we do it instinctively or with a degree of self-determination, we adapt to the changes and demands of environments by regulating the energy sources we consume and the energy sources we release. Self-perpetuation: Survival is our most primal urge, and in satisfying it with boundless creativity we perpetuate not only the survival of our own species, but the survival of the unfolding process that engenders us. Transformation: We have the innate capacity to transform, and be transformed by, the world in which we exist. And depending on opportunities, or the lack of them, our capacity to transform and be transformed … whether destructive or creative, limiting or nurturing, minor or monumental … is transferred onto successive generations. I believe that if every one of us knows how deeply interconnected we are … how identical in essence, how equally dependent on the equilibrium of the environment … we will stop overwhelming our source of life – we will stop killing each other. I challenge anybody to look inward into the beauty, and the simplicity, and the creativity of the universal blueprint within her/his own life, and then continue to disown its equalizing power. Laser light is much purer than ordinary light. In ordinary light the waves are random, jumbled up and run along like schoolchildren racing down a corridor when the bell rings for home time. But in a laser beam the light waves are coherent; they all travel precisely in step, like soldiers marching on parade. When a laser beam is split up in two to make a hologram, the light waves in each beam continue to travel in identical steps. But while one of the beams, the reference beam, is directed unencumbered onto a recording medium, the other, the object beam, is first directed at the object, and then redirected onto the recording medium. Since the object beam was disturbed by reflecting off the outer surface of the object, when the two beams are recombined in the photographic plate, they intersect and interfere with each other, and the interference pattern they create is a virtual image of the object. That image is burned permanently by the beams into the photographic plate, and the hologram becomes a permanent record of what something looks like seen from any angle. Since every point in the hologram catches light waves from every point in the object, wherever you look at the hologram you see exactly every point as if you had been looking at the real object, and as you move your head around, the holographic image appears to change just as the image of a real object changes. That is why holograms appear to be three-dimensional. We are like a hologram. We imprint each and every cell we create in our bodies with the same blueprint that not only contains precise instructions on how to grow and develop our specific organism, but also commands them to comply with a set of universal properties … Become, Self-organize, Bond, Self-generate, Adapt, Self-perpetuate, Transform … while at the same time endowing them with a degree of freedom to affect and be affected by their internal and external environments. Our Universe is like a hologram. It imprints each and every one of its creations, you and me included, with the same blueprint that not only contains precise instructions on how to grow and develop in specific environments, but that also commands us to comply with a set of universal properties … Become, Self-organize, Bond, Self-generate, Adapt, Self-perpetuate, Transform … while at the same time endowing us with a degree of freedom to affect and be affected by our internal and external environments. This is the blueprint of Creation: Every moment we create something eminently new and something eminently old. This is how, as you and I constantly re-create ourselves upon the lessons of our primal inheritance, our Universe re-creates itself. This kind of interrelatedness is about impossible for us to comprehend under a Paradigm based on our separation from Nature. But amazingly enough, over two thousand years ago, the Greek philosopher Anaxagoras [500-428 BC] already saw the interrelatedness of everything: “There is something of everything in everything”. This is the key to a better understanding of what we are: Because every one of us is imprinted with the same universal blueprint, the whole magnificent mystery can be glimpsed at by understanding ourselves. Answers to the mystery of the Universe are contained within us. There is a growing number of people … especially amid younger generations … beginning to see themselves not as citizens of a Nation, but as citizens of the World. This movement has been incited by the brutalities committed in the name of Nationalism, and by the shortsighted disregard of Nations and multi-national corporations for the disadvantaged and for the environment. Although it is exciting to see movement towards the recognition of our citizenship of the World, I hope it leads, soon, to the recognition not just of our citizenship of the World, but of our citizenship of the Universe – as we fundamentally are. This is why it amazes me to no end to see how scientists, already in the possession of physical theories that clearly demonstrate our connection with our Universe, cannot see the connection because they treat the individual theories they specialize in as if they have nothing to do with the rest on Nature, thus overlooking the Universal Process that encompasses not only the infinitesimally small and the infinitely immense, but also the world in between … the world of our experience. Everything in Nature is bound by and participates in a Universal Process; a Process that begins upon Becoming and proceeds into Self-organization, Bonding, Self-generation, Adaptation, Self-perpetuation, Transformation. The universality of this Process is self-evident in all of Nature, and although it manifests in infinitely diverse ways … trees, stars, human beings … nothing can exist without it. But what is not self-evident, not yet, is the Plan … the magnificent Blueprint … that unites us all through a set of universal characteristics transmitted from generation to generation (akin to our DNA code) ensuring the perpetuation of the Process. Trees, stars, human beings are congregations of interconnected components which we intuitively bond together into cohesive, dynamic, pliable and self-sufficient systems (Bell’s Theorem). Trees, stars, human beings attain Permanence through a sustained equilibrium between the energy we consume and the energy we generate (Relativity, Dissipative Structures). Trees, stars, human beings self-contain, self-regulate, self-generate and self-perpetuate while maintaining our given configuration (Autopoiesis). Trees, stars, human beings are utterly unique in our composition and, at the same time, common components of the digressions and progressions of our parent system (Complementarity). Trees, stars, human beings self-organize as a cohesive, self-sufficient unit through the reiteration, at every level of our system, of an overruling evolutionary model (Mandelbrot Set). Trees, stars, human beings develop in accord with the evolutionary process of a parent species, yet we are undeniably endowed with a degree of choice in adaptation (Evolution). Trees, stars, human beings are catalysts for transformation (Quantum Field Theory). When we look deeply not into what separates us, but what unites us, it is impossible not to see the connection: As the trees and the stars, we are citizens of the Universe. It is very difficult for the non-scientist, non-mathematical mind to comprehend the concept of Einstein’s E=mc2: “The mass of a body is a measure of its energy content” (his own words, highlight mine), but it will be less difficult when we add the “body”, the System, as a fundamental part of it (S[e=mc2]). The vast distances between the planets, between the stars, between the galaxies, are difficult for the human mind to comprehend. And so to have a vague sense of what those distances are, let us review some of the information we already possess starting with the picture below taken by the Cassini Spacecraft in 2013, which shows Earth from the rings of Saturn as a tiny spec of light (click on picture to enlarge). Since the orbits of the planets around the Sun are ellipses, the distance between Earth and Saturn when closest to each other is approximately 1.2 billion kilometers (746 million miles), and when farthest from each other is 1.7 billion kilometers (1 billion miles). 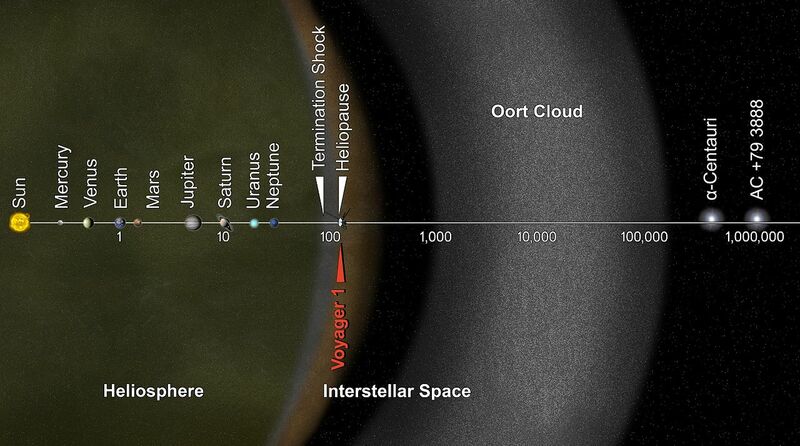 To simplify these enormous distances between the bodies of our Solar System, Astronomers use Astronomical Units (au) which is the average distance from Earth to the Sun at 150 million kilometers (93 million miles). 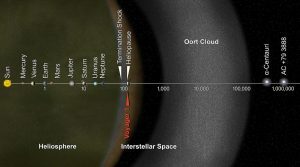 And so the average distance from Earth to Saturn is a mere 10 au, as compared to the distance from the Sun to the Heliopause at 100 au (see chart below showing Voyager 1 traversing the Heliopause in 2014 after 36 years of travel), and the distance from the Sun to the Oort Cloud (the theoretical boundary of our Solar System) at ~100,000 au. To simplify the astronomical distances beyond our Solar System, Astronomers use Light Years which is the distance Light travels in a year at 299,792 kilometers (186,000 miles) per second. 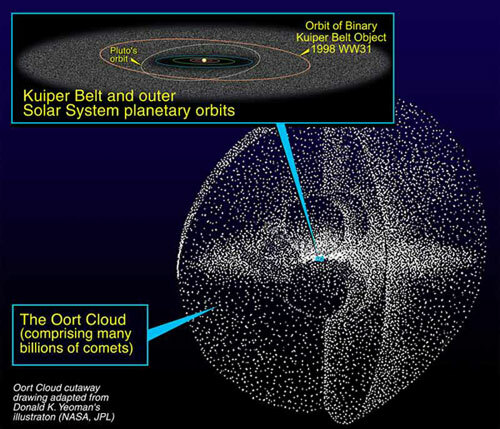 And so, for instance, the distance from the Sun to the farthest edge of the Solar System is 0.3 light-years, and the distance from our Sun to our nearest star, Alpha Centaury (a binary star system), is 4.3 light-years. When we consider all together 1 – the vastness of our Solar System, 2 – the fact that the Sun holds 99.8% and the planets, moons, asteroids, etc., 0.2% of the mass content of the entire System, and 3 – the fact that the rest of the Solar System, what we call ‘the void’, is the energy content the System exerts … the pull and push … to sustain relative equilibrium as a cohesive unit, we can then begin to glimpse at the meaning of the quantities in Einstein’s equation: The mass content of the Solar System, 1.0014 solar masses, times 299,792 km (186,000 ml) squared, is the relative measure of the energy contained in a bubble with an estimated diameter of 200,000 au (see picture below). Our Sun is an average-sized star, with other stars in our galaxy 100 times more massive and others just 1/10 of its mass, and it is 4.3 light-years away from our closest star, Alpha Centaury. If we assume 1 – that to be relatively stable each star must maintain a distance from its neighbors proportional to its mass, and 2 – if we take the number of stars in the Milky Way at 200 to 400 billion embedded in a sphere estimated to be ~180,000 light-years in diameter, we can then begin to fathom the content of the vast voids between its stars … what we currently call “dark energy or dark matter” … which is the equivalent energy the galaxy requires to survive while spiraling through space as a cohesive unit. Now, considering 1 – that the Milky Way and Andromeda are currently about 2.5 million light-years apart, 2 – that our Universe has, at least, 100 billion galaxies embedded within an oval bubble estimated to be 93 billion light-years in diameter … and expanding … and 3 – that if all those galaxies are separated, like the Milky Way and Andromeda, by distances proportional to their mass, we can then begin to fathom the contents of the immense voids between them … what we currently call “Dark Matter or Dark Energy” … which is the energy the Universe requires to survive as a cohesive unit, while it has been unfolding across eons and eons of time into manifold levels of complexity and order. These figures are staggering … incomprehensible to the human mind … and are, as we know full well, subject to revisions as technology improves. And yet they are even more staggering at the other end of the spectrum; there are, for instance, an estimated 32.7 trillion cells in a human body with ~86 billion neurons in the human brain, and each neuron has an estimated ~200 to ~700 trillion atoms, and each atom is a pocket of relatively minute mass and enormous energy content … think Hiroshima. Things in our Universe are mostly made out of energy, and we are no exception. That is the reason why we can move our bodies to accomplish incredible physical and mental feats … climbing Everest; engendering and raising a progeny; landing a man on the moon; imagining, as Einstein did, the proportion of energy to mass in our Universe; seeing, as Darwin did, the unfolding of Evolution through creativity in adaptation, or simply getting up each morning to face the world. But this is a subject for another post. It is incontestable that we are immersed in a fantastic, immensely creative, adaptable, self-organizing, self-generating Universe, and that we are, as far as we know, the only beings becoming more and more consciously aware that, with about 86 billion neurons in our brains, we are like the first little neuron in a developing infant which, upon the first days after birth, begins to build the web of interconnections that ultimately brings the conscious self-awareness of the world within its own and beyond its own. Our quandary is that we have fields of inquiry searching for the smallest particle, and other fields searching for the farthest object in our Universe. And unless we integrate them into one field of inquiry; a field encompassing the microcosm and the macrocosm and the world in between … the world of our experience …. we will never be able to see the astonishing, self-creating beauty of the Whole Being from which we are made and within which we are immersed. And so the beauty of Relativity we are not yet aware of, is that it unites every single body in our Universe … without regards to levels of complexity, and from the infinitesimally small to the infinitely immense … with the common urge to survive, whether by instinct or conscious self-determination, through the attainment of the equilibrium embodied in the equal symbol of (S[e=mc2]); “The mass of a body … or system … is a measure of its energy content”. Note: New posts are usually published on the 1st and 15th of the month. To subscribe to the Blog click on the RSS feeder (orange icon) on the left column of the Home page, down below the Archives. At the most fundamental level a body, or system, or phenomenon, is a single substance with dual contents: one is Mass, the other Energy. A body grows and develops within a supportive environment through an instinctive process of assimilation, transformation and dissipation of energy sources … converting energy into mass and mass into energy. This process is inherited from primal ancestry, but it is subject to the rigors of a Universal Principle … E=mc2 “The mass of a body is a measure of its energy-content”* … which demands (without regards to size or level of complexity) that the body attains, and sustains, relatively constant equilibrium between its mass and the energy it assimilates from, and dissipates back into its environment. No exemptions to this rule; nothing in Nature … nothing, not even us … can grow and develop without abiding by this Universal Principle. And if for any reason (environmental devastation, disease, age, catastrophic event) a body is rendered unable to sustain equilibrium between its fundamental contents, it either restructures or perish. Let us apply the rigors of the Universal Principle to bodies/systems/phenomenon most of us are familiar with: The human body and the human species. Engendered upon the union of ovum and sperm, each one of us instinctively begins our development within a supportive environment through the process of assimilation, transformation and dissipation of energy sources which are provided, at first, by nutrients in the womb, and thereafter by the resources of the environment at large. From the moment the first two cells merge and become one of us, we innately know how to abide, in order to survive amidst constant change, by the Universal Principle. And so, whether we do it instinctively or with self-determination, at every step of our development … from duplication of cells, to a mature, self-reflective being … we keep what we consume in relative equilibrium with what we put out; we must restructure if we fail to do so, or perish otherwise. Our species has evolved within the supportive environment of the earth through the instinctive process of assimilation, transformation and dissipation of energy sources … converting energy into mass (population growth) and mass into the energy of evolutionary development. This process is under the equal rigors of the Universal Principle … E=mc2 “The mass of a body is a measure of its energy content” … which demands that as the species develops, we attain, and sustain … whether we do it by total instinct or by our determination … a relatively constant equilibrium between what we assimilate from the environment and what we dissipate back into it. If we, as a whole, are unable to sustain this equilibrium, we either restructure, or perish. Whether it is a molecule, a cell, a tree, a human being, a species, a planet, a galaxy the process of assimilation, transformation and dissipation in equilibrium with the intake and release of energy sources, is crucial to Survival. But Survival is not possible without the capacity of the body, system or phenomenon, to be in equilibrium with its environment. And so, if survival in Nature is not possible without the actual physical action of a body, system, or phenomenon to attain … whether it is by instinct or self-determination … relative equilibrium not only between its mass and energy contents, but also with the environment in which its survival depends – would it not then be more accurate for E=mc2 to be represented as (System[e=mc2]), or simply (S[e=mc2])? Would it not the global acceptance of this knowledge bring in us the full realization of the fact that, our exponential growth, compounded by the unsustainable levels of our consumption, is changing irreversibly the chemical equilibrium of the environment in which our survival depends? *Einstein’s September 1905 paper. Highlight mine. We tend to think of Dimensions almost exclusively under the perspective of Physics and Mathematics (two dimensions, three dimensions, ten dimensions etc., etc.). But there are other Dimensions, some of which are intimately intertwined with us … the dimension of the cells, the molecules, the earth’s environment … others appear to loom distant … the dimension of the stars, the galaxies, the clusters of galaxies … yet are entwined with us by the recurrent pattern of a universal blueprint that defines us all: Become, Self-organize, Bond, Self-generate, Adapt, Self-perpetuate, Transform. We live in a Universe of multi-scaled and interrelated dimensions in which larger dimensions … the dimensions of stars, galaxies, clusters of galaxies … cannot exist without the smaller dimensions … the dimensions of atomic particles, molecules … nor the smaller dimensions can exist without the larger ones. A dimension is what we experience as the ‘environment’ in which we exist and evolve; the environment that incites us to become, and self-organize, and bond, and regenerate, and adapt, and transform. We know there are other dimensions within us … the environments of cells and molecules and atoms … that although seemingly independent from us, just like us also become, and self-organize, and bond, and regenerate, and adapt, and transform. We also know that there are other dimensions in which our lives are embedded and dependent upon … the environments of species and the earth and the solar system … which although seemingly independent from us, also become, and self-organize, and bond, and regenerate, and adapt, and transform. And so besides the dimensions of Physics and Mathematics, a dimension is the distinct environment … scales within scales within scales … in which the recurrent pattern of becoming and self-organizing and bonding and regenerating and adapting and transforming, is repeated at increasing and decreasing scales in individual systems (entities) as well as in congregation of systems (species) … atomic particles, complex molecules, microbes, insects, vertebrate and invertebrate creatures, plants, planets, solar systems, galaxies, clusters of galaxies. This recurrent pattern is flexibly pre-determined and so, open to Transformation. It is thus that the existence of a human being, for instance, although relatively pre-determined by the distinct environment of the solar system in which human life has been allowed to evolve, has a degree of choice in adaptation … we do have the capacity, although not always in creative ways, to transform ourselves and the world around us. Proportionately, although the existence of a DNA molecule is relatively pre-determined by the distinct environment in which DNA molecules are allowed to evolve, it has a degree of choice in adaptation. Proportionately, although the existence of a solar system is relatively pre-determined by the distinct environment in which solar systems are allowed to evolve, it has a degree of choice in adaptation … ours wouldn’t have had otherwise the choice of creating the environment for the evolution of conscious self-awareness; the relatively steady environment that has brought perhaps something entirely new into the Universe. But dimensions can be imperceptible from each other. 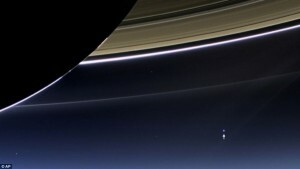 The dimension of our solar system, for instance, is imperceptible from the dimension of humankind, as the dimension of humankind is imperceptible from the dimension of the solar system … just try as you may to find any hint of us in the picture of earth (arrow)* taken by Cassini spacecraft from the rings of Saturn. Similarly, the dimension of a human being is imperceptible from the dimension of a neuron in our brains, as the dimension of a neuron is imperceptible from the dimension of a human being, yet, as we well now know, they are intimately intertwined … a single neuron can be the catalyst for a complete change in us. The recurrent pattern of the universal blueprint emerges at all scales without regards to size or level of complexity, intertwining all the dimensions and creating Symmetry across the entire Universe; a Symmetry our current understanding does not allow us to perceive, which enfolds the fact that a supple pre-determination and a degree of self-determination (a degree of choice) are universal properties, yet relative to the dimension in which individual systems (entities) as well as congregation of systems (species) exist and evolve. Besides the dimensions of Physics and Mathematics, there are many other dimensions … “So, in this world, may many others be” in Margaret Cavendish insightful poem below … which are imperceptible from our own dimension, yet intimately interwoven with us, and us with them. Just like as in a nest of boxes round,/Degrees of sizes in each box are found:/So, in this world, may many others be/Thinner and less, and less still by degree:/Although they are not subject to our sense,/A world may be no bigger than two-pence./Nature is curious, and such works may shape,/Which our dull senses easily escape:/For creatures, small as atoms, may there be,/If every one a creature’s figure bear./If atoms four, a world can make, then see/What several worlds might in an ear-ring be:/For, millions of those atoms may be in/The head of one small, little, single pin./And if thus small, then ladies may well wear/A world of worlds, as pendents in each ear. Uncanny to realize how most of humankind cannot perceive our intimate connection with our Universe … our connection to that creative, evolving, living organism that gives us life with a subtle yet forceful mandate: Self-create, self-organize, Become, Bond, Adapt, Regenerate, Self-perpetuate, Self-transform … when the connection is in plain sight for all of us to see. You and I, as the Universe, were engendered with the capacity to generate our own components, to organize them into complex systems, and then to synchronize them to work together to achieve Adaptation, Self-determination and Self-transformation towards complexity. Perhaps this intimate connection with our Universe is difficult for us to perceive, because it is hard to conceive something as inconceivable as to be like an entire Universe. But how else to account for the fact that we exist, only, because each one of us is imprinted from the moment we are engendered … in the same way we imprint each cell we engender in our bodies … with exactly the same universal mandate: Self-create, Self-organize, Become, Bond, Adapt, Regenerate, Self-perpetuate, Self-transform. Whether the Natural Sciences and Organized Religions disagree with this undeniable aspect of our Reality, is of no consequence to me. Both have disagreed many, many times in our history … oftentimes with extreme cruelty and force … to ideas that open our minds to greater Knowledge, just because they dare to challenge their dogmatic status quo. I grew up in a world of challenges and contradictions, like most of us do, with fundamentally the same brain, the same organic senses, the same urge to survive amid changing environments, the same instinctive drive to follow … as everybody else … the same universal mandate: Self-create, Self-organize, Become, Bond, Adapt, Regenerate, Self-perpetuate, Self-transform. But I grew up rebelling against any ‘authority’ limiting my mind from exploring beyond what we have already learned, what our limited organic senses allow us to perceive. And observing Nature, and learning from those with open, inquiring minds, I came to perceive our intimate connection with our Universe. It is thus I believe that if I had the capacity to do so, anybody can. And so it gives me hope to imagine how different humankind will be when all of us can see that, as each one of us is, our Universe also is full of contradictions … rational and irrational, nurturing and cruel, creative and destructive, chaotic and ordered, full of horror and extreme beauty … and that as our Universe urges us to re-generate, and adapt, and survive, and self-transform, It also urges itself to do the same … exactly the same. It is through the perception of this affinity, that an understanding of our intimate connection with the Being that gives us Life, is attained. It is perplexing to see how most of Humanity … the great majority of us … as intelligent and advanced a species as we claim to be, cannot yet perceive the self-evident Universal Order inside of us and all around us; the perceptible, measurable, self-creating, self-organizing Universal Order inherent in everything in Nature; the Universal Order that from the convergence of two minute cells organizes our bodies into the self-reflective and limitless imagining power of our minds; the Universal Order that generates the progression of atomic compounds into complex, dynamic and intricately interrelated systems; the Universal Order that demands of us to consume other living forms in order to live; a Universal Order that unifies each and all us … each physical system in our Universe* … with a mandate to self-organize, to self-generate and adapt in order to perpetuate its own self-renewal. And yet it is even more perplexing to see how the Natural Sciences, especially physics and chemistry with their great insights into the structure of microcosmic and macroscopic magnitudes, are unable to link their findings and see how intimately interconnected they are, and thus still searching for a Unified Theory when they already have one. No matter how minuscule we are in our Universe, we are nonetheless a physical system that like an atom, a molecule, a cell, a solar system, a galaxy, the Universe itself, embodies the traits of the shared blueprint that connects everything into a Universal Order. And so the Universal Order is in us and we are within the Universal Order. When will we be able to learn to incorporate this self-evident Fact into the way we perceive ourselves and the Universe that engenders Existence with a degree of freedom in adaptation? * In physics, a physical system is a portion of the physical universe chosen for analysis. Everything outside the system is known as the environment (Wikipedia). Note: New posts are usually published on the 1st and 15th of the month. To subscribe to the blog click on the RSS feeder (orange icon) on the left column of the Home page down below the Archives.